The intensity of the recording reflects that of the activity on stage. It also is a metaphor for the integrity with which Leif has pursued his career without damage to his originality, spirit and sense of humour – dark and offbeat, but never losing sight of the fun. His other releases, usually as part of the Firework stable, include the book Experiments with Dreams[every toilet should have one so you can laugh and crap at the same time] and one of the finest CDs ever recorded, Talking to a Dead Queen . For Ash he contributed to Antitrade , and co-authored The National Anthem of Elgaland-Vargaland [Ash 3.3, 1996] with CM von Hausswolff. 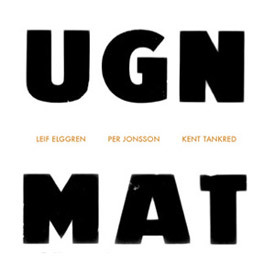 Leif Elggren / Per Jonsson / Kent Tankred – UGN/MAT The activities of Sweden s Leif Elggren and his friends, generously documented by Ash International and Elggren s own Firework Editions, blur the lines between sound art, composition, and performance art. Among their exploits are recordings of laughter, snoring, vehicles, and unexplained voices; experiments with dreams, beds, corpses, and politics; books of random names and obnoxious letters written to celebrities; and the administration of the imaginary Kingdom of Elgaland-Vargaland. UGN/MAT documents two separate performances. A description of the disc s contents provokes the question “why?” Then again, art neither requires nor allows for easy answers. The staged presentation of UGN (“Oven,” 1984) involves a pot of porridge, 27 girls dressed in white, tools, actors, and smashed porcelain. Take away the spectacle, and you re left with 25 minutes of low-definition rumble highlighted by windy noises, sporadic clamor, and a climax that sounds like a recording of an airport runway. MAT (“Food,” 1989) begins after a minute of silence. Again, the stage elements a dog in sheep costume, 10 actors with false beards eating potatoes and pills are incidental, bearing little relation to the disc s 35 minutes of stilled drone. No doubt it all means something, especially when played loud, but its still very odd. From the strange world of performance art comes this noise work from the 1980s that has been reissued to coincide with the Leif Elggren retrospective at the Fargfabriken gallery in Sweden (www.fargfabriken.se). The Swedish artist/composers Elggren and Tankred have collaborated often, performing in art and music spaces all over Europe. UGN (Oven) was recorded in the artist-run Electroacoustic Music Studio in Stockholm for a performance in 1985, and originally released on vinyl the next year by the music and text publisher Radium. The piece brought the intense sound and violent actions of factories to contemplative art spaces as the two performers made porridge in industrial ovens. Rumbling bass frequencies simulated the roar of blast furnaces as sledge hammers were used to smash porcelain. Maybe if they danced around while they swept up the Swedes could have played Broadway with Stomp. Altra cosa il documento di due performance, UGN/MAT, del sound artist nordico Leif Elggren, aiutato da per Jonsson e Kent Tankred (che qui si avvalgono però di normale strumentazione elettronica): sgranati microrumorismi, vibrazioni magmatiche e oscuri fragori che suggeriscono eventi misteriosi, in un’espressionistico viaggio ai confini del’industrial ambient, che intriga senza bisogno di supporti visuali. Si distingue fin dalla deliziosa copertina, da ritagliare e incollare per construire un minuscolo cottage di campagna (!). Nach einem famosen Elggren-Solo-Beitrag zu HISS nun eine Austellungs-Doku zu seiner “Flown Over By An Old King”-Retrospektive letzten Oktober. Die Frage nur, wie muss man sich den Weg an seinen fast sphärischen Objekten vorbei vorstellen, damit sich der Höreindruck hier auch nur annähernd bestätigt? Fertige Objekte scheint es sicher nicht zu geben, eher ihre Fertigung im Brennofen, den Schmelzungs- und Kompressionsprozess, der mit seinen Breitbandspektren den Raum völlig ausfüllt. Überall reibt sich Metall mit seiner Entstehung, muss geformt, geschliffen, zurechtgestutzt werden, wieder erhitzt werden und einer neuen Formung weichen: ein Prozess stetiger Transformation, die die Indexierung hier dreimal beschwört. UGN, MAT und ein Zwischen, das sich einer rechten Zuordnung entzieht, eher als undefinierte Instruktion oder als kollektives Schwebungsprodukt mit minimaler Hz-Zahl zu lesen ist. Es sind diese kleinen Schwankungen im System, die es immer wieder stabilisieren, ihm letztlich seine Festigkeit und Dauerhaftigkeit verleihen, wenn auch schon ein fast nur erahnbares Belcanto ausreicht, das Gleichgewicht zu stören, die systemimmanenten Ausgleichsinstruktionen zu aktivieren und wieder in ein Gleichgewicht einzupendeln, das noch lange nach Auswurf der CD nachhallt. UGN/MAT was released in conjunction with a retrospective exhibition of Swedish conceptual artist Leif Elggren’s work presented in Fall 2000 at FŠrgfabriken (Stockholm, Sweden). The CD contains two pieces recorded in the 1980s for use in stage performances (the middle track “60 Seconds of Silence for Per Jonsson” is actually just that). “UGN” (“Oven,” 25 minutes), recorded in December 1984, was first released in 1986 as a 12″ by Radium. The piece opens on very low bubbling noise, breaking free only three and a half minutes later. A shroud of low-frequency noise is punctuated by what sounds like a carpenter working (hammering nails in wood, particularly), with occasional electronic sounds cutting through. An opera excerpt intrudes for a brief moment ten minutes before the end and the shroud is replaced by dense and busy noise at minus six minutes that will slowly fade out, leaving the aforementioned opera faintly heard in the distance. “MAT” (“Food,” 35 minutes) is closer to the dynamics of electroacoustic works, although it unfolds very slowly. Both pieces have complex trance-inducing walls of sound, but require time and openness to be appreciated. Originally released on Ash International back in 2000, the two lengthy pieces making up this disc are actually rather older than that: ‘UGN’ was recorded in December 1984 at EMS in Stockholm, and was first released as a 12″ by Radium 226.5 in 1986. ‘MAT’ came a little later, also recorded at EMS, but in May 1989. Led by Elgaland-Vargaland founder Elggren, these two documents still have the ability to confound, yet both retain an enormous sense of power. From ‘UGN’ you can expect a bizarre array of electroacoustics that converge on a kind of noise-based performance art, shifting through dark rumbles, mangled operatic vocals,strange percussive gestures from within the room and distant string dissonance. It’s hard to work out quite what’s going on, but the wonderfully absurdist feel to it all is amped up considerably by the accompanying text’s reference cues: “In the oven the porridge cooking” and “27 girls dressed in white”. At thirty-five minutes, ‘MAT’ is ten minutes longer than its counterpart, and spends much of its duration stirring up a more subtle, drone-based soundscape. Not without a tendency to erupt into spillages of manic noise and industrial abrasion, this is the kind of musical rabbit-hole Nurse With Wound and The Hafler Trio like to lead you down – challenging, sonically unfathomable and lined with a peculiar sense of humour, UGN MAT comes highly recommended.